There's only one long-term solution to the nuclear threat in the White House: disarmament. 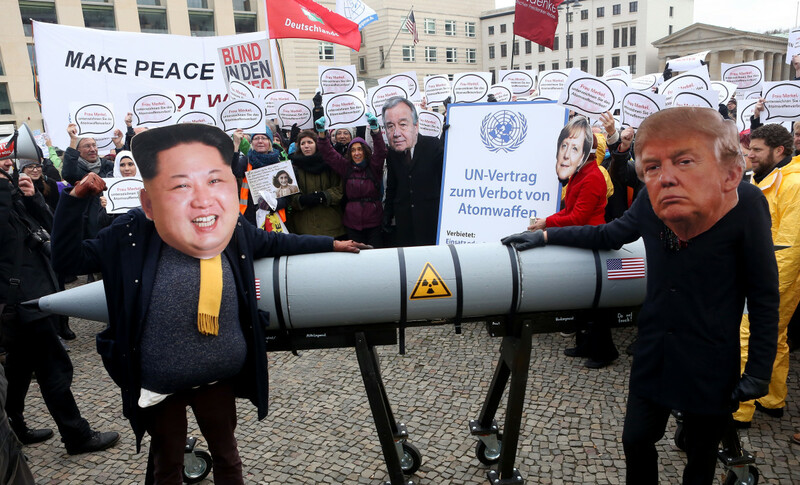 Activists dressed as North Korean leader Kim Jong-un and U.S. President Donald Trump march with a model of a nuclear rocket during a demonstration against nuclear weapons in Berlin on November 18th, 2017. President Donald Trump&apos;s fascination with nuclear weapons may be troubling, but his cavalier attitude toward nuclear war is terrifying. "Will someone from his depleted and food starved regime please inform [North Korean leader Kim Jong-un] that I too have a Nuclear Button," Trump tweeted in early January, finishing with the boast that "it is a much bigger & more powerful one than his, and my Button works!" 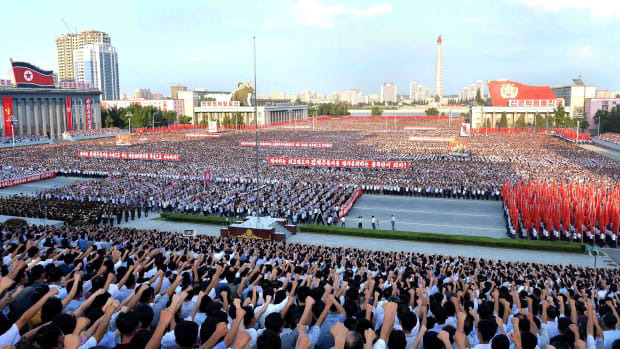 Within a day, North Korea re-established communication with South Korea via a border hotline. Trump claimed credit. 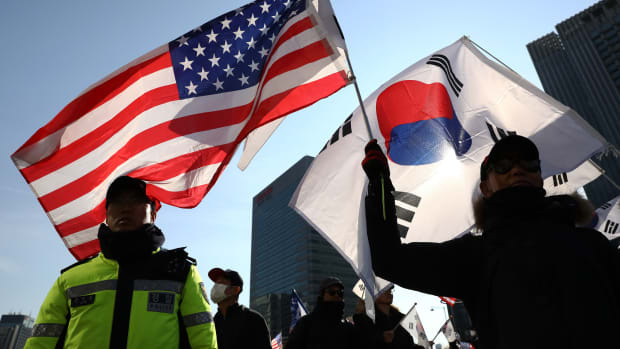 In a way, that&apos;s apt: Because of Trump&apos;s constant, aggressive posturing, there&apos;s a real danger the Koreas will cut the United States out of the loop, to the detriment of American policy objectives. That said, all parties stand to benefit at this point from minimizing interactions between the U.S. and North Korea, given Trump&apos;s volatility and fecklessness. In addition to not-so-veiled threats, Trump has called Kim Jong-un a "maniac," a "bad dude," and, most enduringly, "rocket man." Back in October, Trump said he wanted a tenfold increase in America&apos;s stock of nuclear weapons. Now, he&apos;s loosening restrictions on the use of nuclear weapons and making good on his earlier promise to expand the arsenal. His actions have so alarmed a group of veteran nuclear launch officers that 17 of them sent Congress a letter enumerating their doubts about Trump&apos;s fitness for office and understanding of nuclear weapons. Trump could launch a nuclear weapon all too easily. As Peter Feaver, former National Security Council adviser and current Duke University professor of political science, has noted, Trump "has the legal and political authority on his own to give an order that would cause other people to take steps which would result in a nuclear strike." There&apos;s little doubt Trump would be able to find someone willing to execute his order or, if necessary, someone to force its execution. Bruce Blair, a former nuclear missile launch officer and co-founder of Global Zero, a group advocating for the elimination of nuclear weapons, warns that Trump doesn&apos;t merely have the prerogative to order a strike but also the ability to marshal "all the means at his disposal to ensure that his decision is quickly implemented." The realization that the only thing between Trump and launching a nuke is bureaucracy—i.e. officials and officers whom he can replace or bypass—is chilling. Giving one person the power to use a nuclear weapon was always a bad idea, not to mention illegal and anti-American. In the words of scholar Elaine Scarry, when nuclear power resides in one person, "it&apos;s our whole population that has now been deprived of military rights." Previous presidents treated that power with solemnity and spoke of it in relation to clear threats and goals. Trump, however, is all inconsistency and caprice when it comes to nuclear weapons. 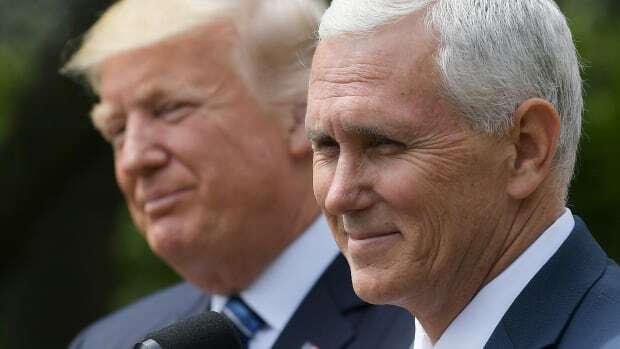 He has given the public fresh reason to contemplate the implications of the president’s singular control, an issue that had previously been relegated largely to the realm of scholarship. In March of 2016, the Brookings Institution&apos;s Michael E. O&apos;Hanlon dismissed the possibility that Trump would be a "psychotic, schizophrenic, or otherwise unbalanced leader." Then, he wrote, "for all his barbs and insults and affected anger, Trump is likely not such a person. But his candidacy is enough at least to raise the salience of the question." Trump&apos;s button tweet has resolved the question of whether there&apos;s cause for concern. "Folks aren&apos;t freaking out about a literal button," tweeted Colin Kahl, former senior adviser on foreign affairs and national security policy to President Barack Obama and Vice President Joe Biden. "They are freaking out about the mental instability of a man who can kill millions without permission from anybody." It&apos;s not just Twitter that&apos;s "freaking"; it&apos;s Congress too. Under Trump, even before the letter from the nuclear launch officers, a congressional foreign-affairs committee held a hearing regarding the use of nuclear weapons for the first time in 41 years. People are right to be concerned: Using just 0.015 percent of the global nuclear arsenal would cause 44 million immediate deaths and one billion deaths over the course of a month. The solution isn&apos;t a matter of a change to process or chain of command. It&apos;s disarmament. "With nuclear weapons, there is a clear solution," Scarry said in an interview with The American Reader. "We need to get rid of nuclear weapons. We need to get rid of our own, which then gives us a moral basis for asking other countries to give them up, and to work hand-in-hand with all the countries that have been begging to have a world free of nuclear weapons." Under Obama, the U.S. was stepping down its focus on nuclear weapons. Like so many other forward-looking policies, however, Trump promptly reversed these moves toward disarmament. 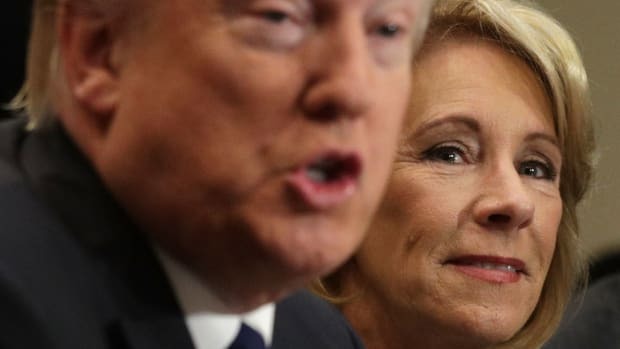 From weakening protections for survivors of sexual assault to axing protections for transgender students, the administration has made no secret of its animosity toward the Civil Rights Act. A prominent scholar of international relations analyzes the disquieting events of recent days. 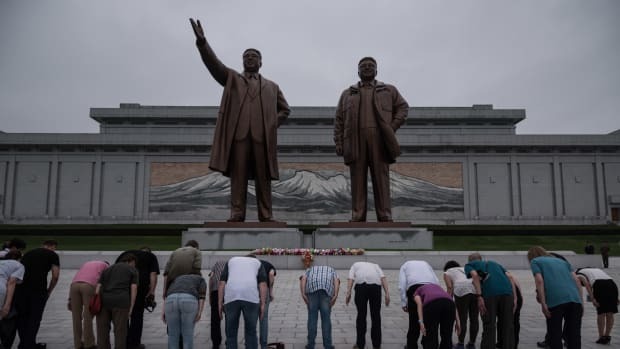 Trump might leave the Hanoi summit with a end-of-war declaration, but one expert warns that, without specific caveats, to do so could make the peninsula even more dangerous. Inside the curious phrase that protects peyote and condemns LGBT people. 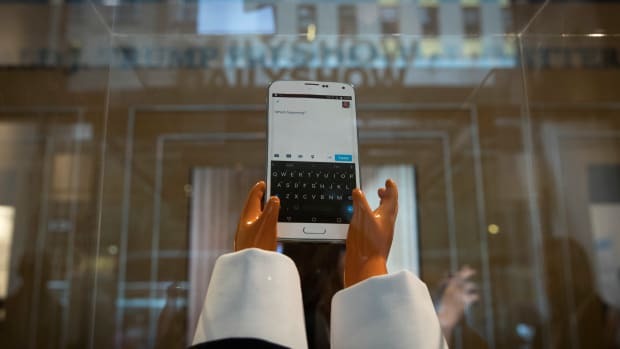 By blocking people from his Twitter account, our lawsuit argues, the president has violated the First Amendment.